Harry Aikines-Aryeetey helped the Great Britain and Northern Ireland team to sit third following the first day of finals at the European Team Championships in Lille. After claiming maximum points in the 100m, the world, European and Commonwealth relay medallist returned to the track to also anchor the 4x100m team to victory for two of GB’s six wins on Saturday. Germany tops the standings with 166 points after 21 of the 40 finals, with Poland in second on 150.50 points ahead of Britain with 144.50. A strong finish secured Aikines-Aryeetey his success in the 100m as the Briton clocked 10.21 for a run that should serve as a welcome confidence boost ahead of next weekend’s British Athletics World Championships Team Trials. Germany’s Julian Reus was second with 10.27 ahead of European champion Churandy Martina of Netherlands with 10.30. 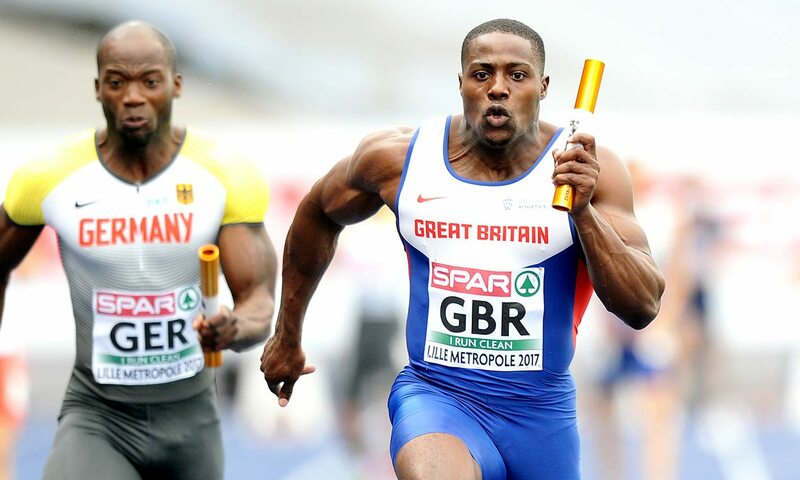 A short while later Aikines-Aryeetey teamed up with Chijindu Ujah, Zharnel Hughes and Danny Talbot to storm to success in the sprint relay, their time of 38.08 an impressive championship record and enough to see them finish clear ahead of Germany with 38.30 and France with 38.68. “It was nice to cap off my third race of the weekend with a championship record with these guys,” said Aikines-Aryeetey, who had been among those to race on a first evening of heats action on Friday. “You can see the joy in our faces because we’ve come together and we’re working hard. The GB women’s sprint relay squad didn’t enjoy the same level of success as a failed third exchange meant the team did not finish. The race was won by Germany in a 42.47 championship record from Poland’s 43.07. Another of GB’s winners was Dwayne Cowan and he gave the 400m his all, diving over the line to clock a 45.46 PB which initially placed him second. But after Dutch sprinter Liemarvin Bonevacia was disqualified, the Briton was promoted to first to secure full points for his team. “I’m pretty pleased,” said Cowan, who is coached by his father, UK Athletics lead sprints coach Lloyd. “It’s perfect conditions for a 400m and I knew I had more there from the first round. 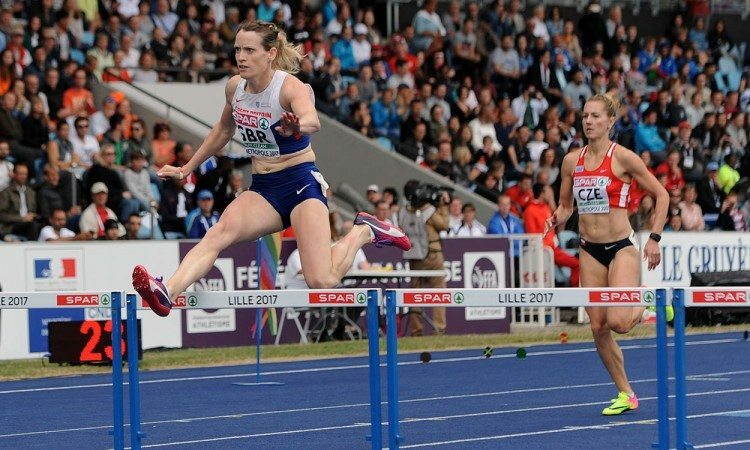 A 400m hurdles double was secured by British team members. Jack Green got the day off to a winning start for the nation, claiming victory in the men’s race in 49.47, before Eilidh Doyle enjoyed a dominant win with 54.60 ahead of Italy’s Yadisleidy Pedroso with 55.39. “That’s what I was looking for – no big stutters and putting together a technically much better race,” said 2014 European champion Doyle. “Even there it wasn’t perfect but I think it was the best I could do in those conditions because it was quite blustery so I made some adjustments to my stride pattern. Britain’s Dan Bramble was the only athlete with an 8.00m leap as he achieved that mark exactly to win the long jump ahead of Spain’s Eusebio Caceres with 7.96m. A storming finish by Jake Wightman in the 1500m saw Britain’s recent Oslo Diamond League winner clock 3:53.72 for second behind Marcin Lewandowski of Poland’s 3:53.40. There was also a well-judged run by GB’s Lennie Waite who saved enough for a final surge in the 3000m steeplechase to secure second in 9:43.33 behind the dominant Gesa Felicitas Krause, with Germany’s world bronze medallist clocking 9:27.02. Another fine run by GB’s Nick Goolab saw the Vitality Westminster Mile winner clock 13:59.72 for second in the 5000m behind Spaniard Antonio Abadía’s 13:59.40. Carolle Zahi claimed a win for the hosts, clocking 11.19 for 100m victory as GB’s Corinne Humphreys impressed with third place, clocking 11.50. Mickaël Hanany also secured maximum points for France as he cleared 2.26m to win the high jump. Britain’s Chris Baker was equal eighth with 2.12m. The women’s 400m was won by Lisanne de Witte as the Dutch athlete came through to pip Ukraine’s Olha Zemlyak with a winning 51.71 PB. GB’s Mary Iheke secured sixth in a 52.60 PB. Belarusian thrower Hanna Malyshik secured hammer victory with 74.56m as GB’s Olympic bronze medallist Sophie Hitchon was fifth with 69.30m. The women’s discus win was claimed by France’s Olympic silver medallist Mélina Robert-Michon after a throw of 62.62m, with Britain’s Jade Lally 10th with 54.01m. Olympic pole vault champion Katerina Stefanidi cleared 4.70m for the win as Britain’s Commonwealth silver medallist Sally Peake finished sixth with 4.35m. In the men’s shot put, Czech Republic’s Tomas Stanek got full points ahead of Germany’s two-time world champion David Storl, a 21.63m equal championship record to 21.23m. GB’s Scott Lincoln was 10th with 17.96m. Ukraine’s Olha Lyakhova secured success in the 800m with 2:03.09, as GB’s Katie Snowden placed ninth with 2:05.19, while Poland’s European indoor 1500m bronze medallist Sofia Ennaoui was on top in the 3000m, running 9:01.24. Britain’s Harriet Knowles-Jones clocked 9:14.86 for ninth. Germany’s Olympic champion and 93.90m thrower Thomas Röhler was beaten in the javelin as his best of 84.22m placed him third behind winner Jakub Vadlejch of Czech Republic who achieved a championship record-breaking throw of 87.95m. GB’s Matti Mortimore was eighth with 72.42m. Greek jumper Paraskevi Papachristou won the triple jump with 14.24m as Britain’s world long jump silver medallist Shara Proctor was ninth with 13.39m.